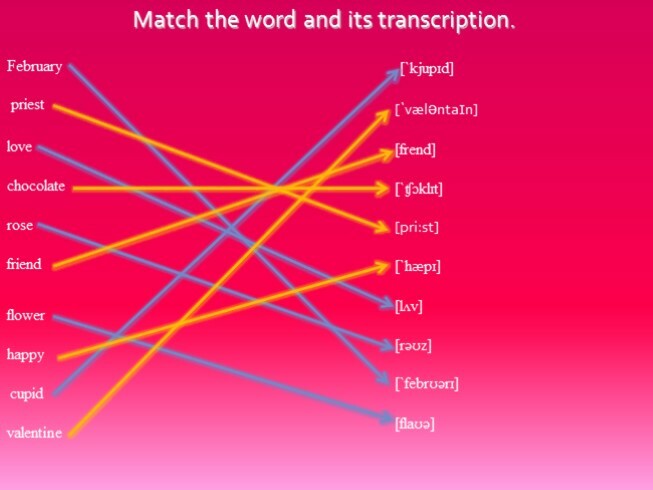 Match the word and its transcription. 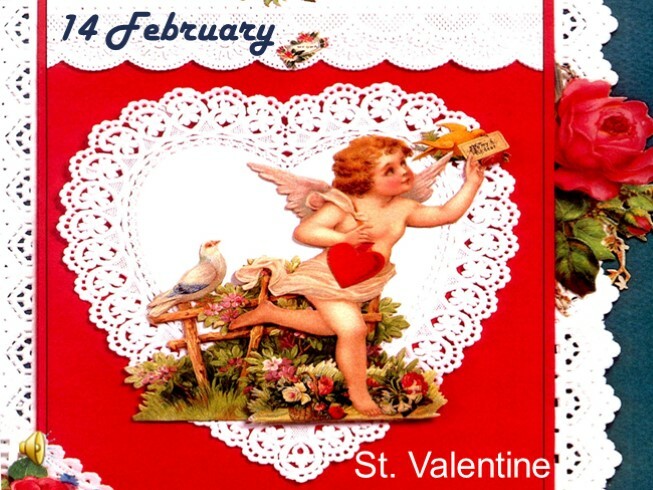 St. Valentine’s Day is a romantic and beautiful holiday for old and young. 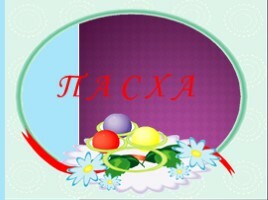 It is celebrated (отмечается) on the 14th of February. 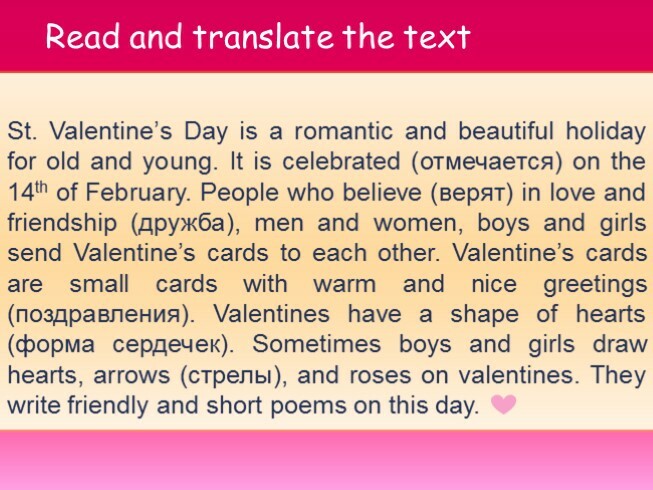 People who believe (верят) in love and friendship (дружба), men and women, boys and girls send Valentine’s cards to each other. 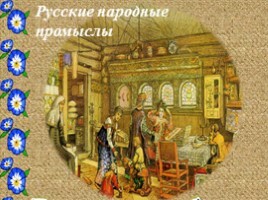 Valentine’s cards are small cards with warm and nice greetings (поздравления). Valentines have a shape of hearts (форма сердечек). 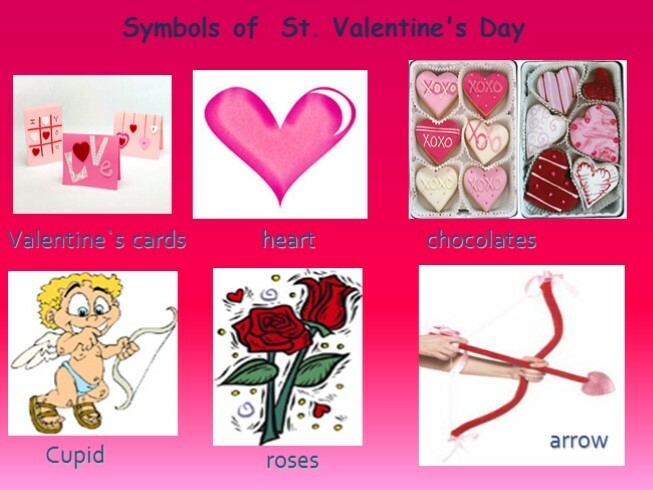 Sometimes boys and girls draw hearts, arrows (стрелы), and roses on valentines. They write friendly and short poems on this day. 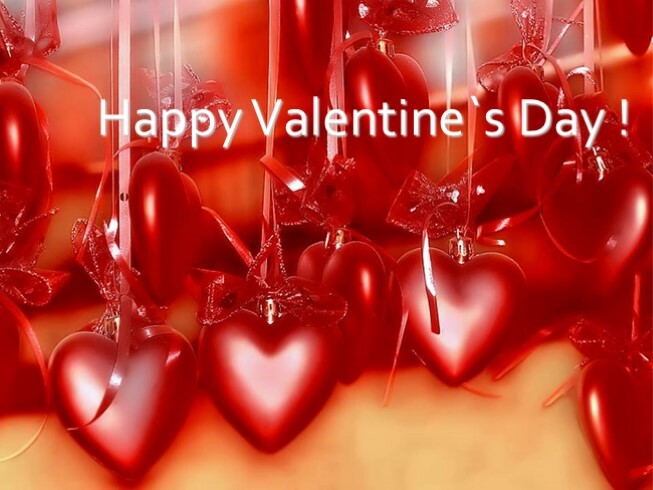 There are a lot of stories and legends about the history of Valentine’s Day. 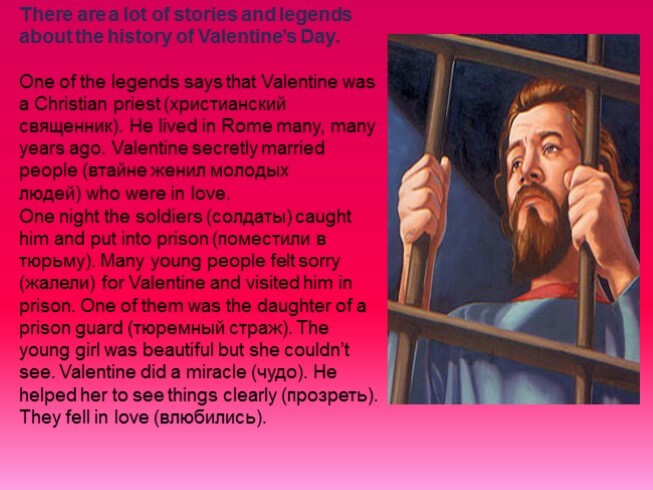 One of the legends says that Valentine was a Christian priest (христианский священник). He lived in Rome many, many years ago. Valentine secretly married people (втайне женил молодых людей) who were in love. One night the soldiers (солдаты) caught him and put into prison (поместили в тюрьму). Many young people felt sorry (жалели) for Valentine and visited him in prison. One of them was the daughter of a prison guard (тюремный страж). The young girl was beautiful but she couldn’t see. Valentine did a miracle (чудо). He helped her to see things clearly (прозреть). They fell in love (влюбились). 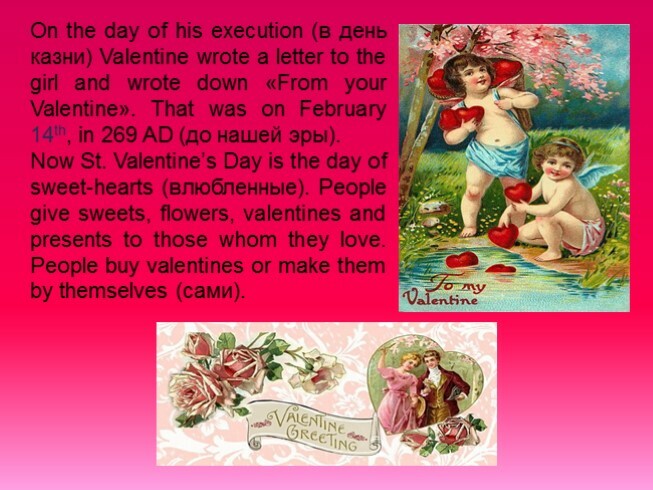 On the day of his execution (в день казни) Valentine wrote a letter to the girl and wrote down «From your Valentine». That was on February 14th, in 269 AD (до нашей эры). Now St. Valentine’s Day is the day of sweet-hearts (влюбленные). People give sweets, flowers, valentines and presents to those whom they love. People buy valentines or make them by themselves (сами). 2. Валентин был христианским священником. 3.Валентин втайне женил молодых людей. 4.Солдаты поймали Валентина и посадили в тюрьму. 5.Валентин влюбился в дочь тюремного стража. 8.Люди дарят валентинки, конфеты, цветы друг другу в этот день. 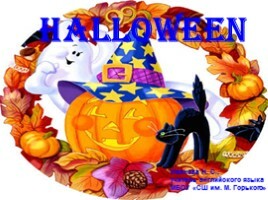 6.Девушка была очень красивой, но не могла видеть. D. Valentines have a shape of hearts. H. Valentine was a Christian priest. B.Valentine fell in love with a prison guard`s daughter. C.Valentine wrote a letter to his sweetheart with the words «From your Valentine». E.The girl was beautiful but she couldn`t see. 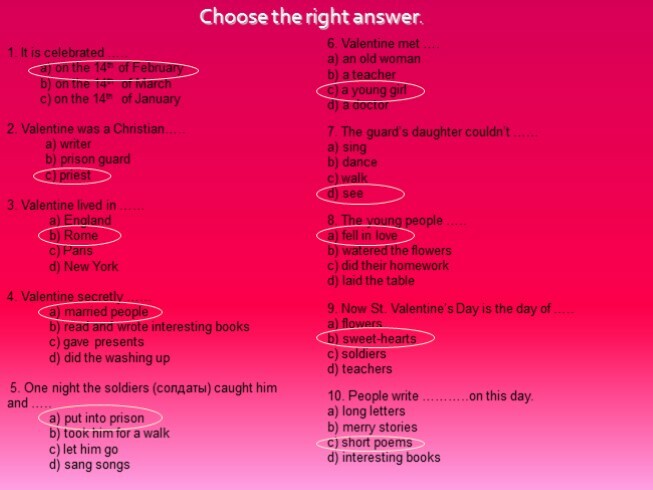 F.Soldiers caught Valentine and put him into prison . G.People give valentines, sweets, flowers to each other on this day. 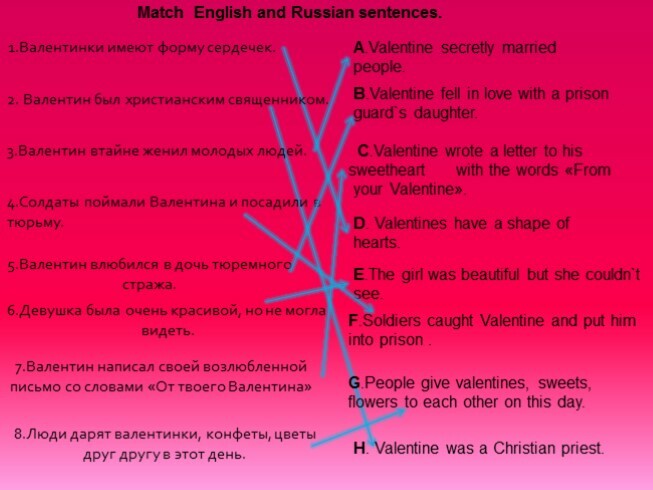 Match English and Russian sentences. 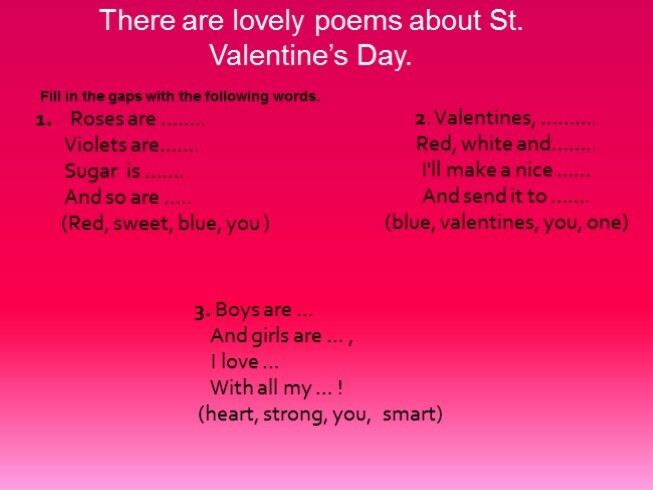 There are lovely poems about St. Valentine’s Day. 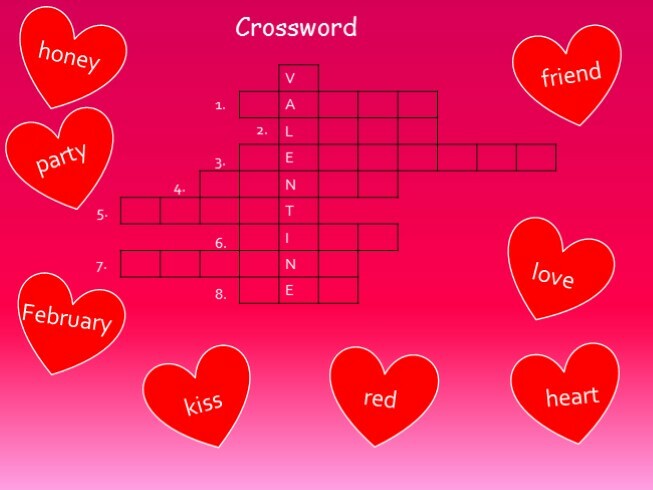 Fill in the gaps with the following words. 1. Roses are red. Violets are blue. Sugar is sweet, And so are you. 3. Boys are strong And girls are smart, I love you With all my heart ! 2.Valentines, valentines. Red, white and blue , I'll make a nice one And send it to you.